be informed there will be a planned maintenance tonight 11th December starting 10pm CET, during which the website will be offline. Planned downtime is approx. 30min. We are introducing Segwit addresses and changes to bitcoin processing as a first step in our efforts to decrease the bitcoin transaction fees. After the deployment tonight, the “Generate new address” button in the Bitcoin Deposit form will provide a new bitcoin deposit address starting with 3 (opposed to the old address format starting with 1). We recommend all users to begin using this new bitcoin deposit address type for bitcoin deposits as soon as possible. The old bitcoin deposit addresses will remain valid for another week, after which they will be deactivated. The automated trading API call “bitcoinDepositAddresses” will require generating the new address in the 1-week transition period. Bitcoin transactions using the new Segwit 3-type addresses take less space in bitcoin blocks and thus contribute to efficiency and lower transaction fees. We are also switching to a more efficient bitcoin transaction processing model. In our further efforts to decrease the bitcoin transaction fees we plan to introduce a low-priority bitcoin withdrawal fee in addition to the high-priority fee (planned for January). New trading pair Bitcoin Cash / Bitcoin will be added. Bitcoin Cash is a hard fork of Bitcoin, the fork occurred on 1st August 2017. 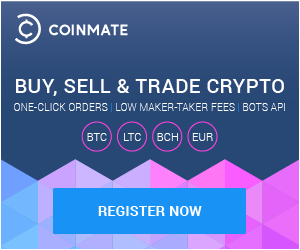 Users that held any bitcoin balance in their CoinMate account on 1st August 2017, will be credited the same amount of Bitcoin Cash tonight. Bug fixes, small changes and system optimization. There are several bug fixes and some small changes in this version including system and database optimizations to cater for increased traffic.